The following list of pathologies linked specifically to playing the piano will make you aware of the physical constraints that may result from intensive practice of this instrument in a bad position. If your symptoms match any of those below, do not worry unduly - instrumentalists usually heal! If, however, none of them match your symptoms, do not ignore your pain, take it seriously. Pain is a signal from your body and should be heeded. Take action and study how you work at your instrument. 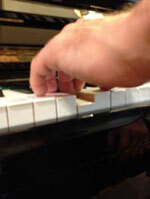 Many pianists suffer from inflammation of the tendons of the fingers, called tenosynovitis. This causes pain on the inside of the palm of the hand or finger. It is usually due to the collapse of the arch of the hand especially in the 4th and 5th finger. The thumb has its own musculature. Its equilibrium is one of the keystones of the pianist's hand. Muscle imbalance causes thumb sprains. Any weakness must be worked on through gentle exercises both with and without your instrument. A pianist's shoulders are greatly solicited and pain due to muscle contracture is common, especially on the right side. The head is often thrust forward, contributing to this tension. In this case, muscular rebalancing of the shoulder girdle and back is essential. 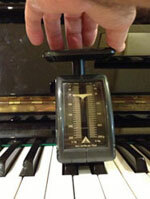 Some figures speak for themselves: to hold a piano key down, you must maintain pressure of 50 grams at your fingertip. If a pianist plays while tensed up, he actually uses pressure of about 150 grams without letting up. Speed is obviously hindered by lack of muscle relaxation. The sound is affected, creating tension that radiates throughout the forearm. To eliminate this, you have to learn to control your finger pressure. 2. Then place your hands on the keyboard, press a key and maintain the same pressure of 50g (the key must remain depressed). 3. Return to the scales to make sure you are maintaining the correct pressure of 50g. You can go back and forward between the scales and the piano in order to feel how your finger relaxes on the key after the intial stroke. A variety of exercises can be derived from this principle. Later I settled in Paris, and at some point started to feel the toll of the years' daily practising, being often on the road with heavy suitcases and a growing concert schedule. I remembered Fleisher's advice and that's when I met Coralie Cousin. She taught me the basic movements; I should say the basic daily hygiene of a musician. For example, how to warm up ones' hands effectively before playing, which stretching movements are important to do daily and so on. The importance of stretching is underestimated in our field and it is strange, as any gymnast or athlete starts his training by stretching. Musicians are a different kind of gymnast. They may not need to jump high, but they need to jump right. 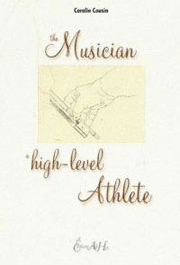 Coralie gave me many exercises that help me maintain a healthy body and I believe that this is the kind of information that would benefit any music student and instrumentalist. 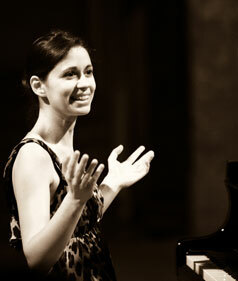 I also enjoyed hearing her point of view on the « perfect hand position raquo;. It reminded me of what my first Russian piano teacher used to say: « Look at your hand when you play. Make sure that it looks beautiful and relaxed and so will your sound be ». Yes, there is a direct correlation between how your hand looks and what comes out of it, and we musicians rarely think about this aspect of playing. Coralie's knowledge in that field is most impressive and I often send her those of my students from the Royal College who need it, to make sure she explains to them from a purely physical point of view the same things I'm teaching.